card number 2! Actually I shouldn't be finishing that statement with an exclamation point as I am soooo far behind in Christmas cards that woo-hooing about my second one made is slightly embarrassing. Oh well. It is what it is. I tried a new HA stamp and cut image that I bought when I went to Scrapfest. Back in mid September....yep! That is how busy my life has been this Fall....I am just now getting to try out a new item! I had this image for a card in mind based on the Christmas song "Silver and Gold" from the Rudolph movie. I mean, I literally had that song pop into my head the minute I saw this stamp! And, I am pretty pleased with how it turned out. I have always liked the silver/gold combo anyways. I double stamped the image...once in silver and once in gold and then embossed both colors in the appropriate metallic matte powder. Then I cut the gold one apart and glued it to the silver one. I then outlined all the white space with in the stamp and around the stamp with glue. Then I sprinkled on Glamour Dust...my most favorite glitter of them all! The silver and gold papers are vellum and they actually got a strange "curl" to them after going through the die cuts. Hence the addition of "bling" in strategic points around the card-the vellum needed to be anchored big time! Then the largest die cut as well as the tree itself are popped up on dimensionals. 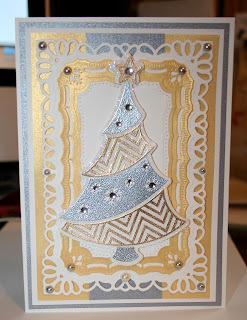 It is really hard to see the sparkle of the glamour dust or the lovely matte finish of the metallic embossing powders but in person this card is really gorgeous.....and so simple to make! I will be entering this in the Hero Arts monthly contest! I haven't entered one of those in ages! Here is my card! And it is 5 by 7 in size. This particular stamp set is only available at Archiver's so I am glad I picked it up when I was in the area.....I think that I will be able to get a lot of different looks out of this set! Thank you for stopping by and I hope that you have a great weekend! Love your silver and gold card Sheila. Glad you got to use your new stamp and die set. This is one G-O-R-G-E-O-U-S card, Sheila! Whoever you send it to will be thrilled to be the recipient, I'm sure! For years I decorated my tree in nothing but silver, gold and white and loved the look. Still use a lot of the same, but with the addition of plums and blues now. This is so stunning Sheila! The colour combo is perfect & I love the dies you have used as well. Wow, Sheila, now I have that song stuck in my head! (I can see the snowman Burl Ives singing in the snow with his tweed jacket and closed umbrella as a cane...) Your card is silver and gold perfection if you ask me...AMAZING! What a great design...I bet it is gorgeous in person! This is really something special Sheila! I love that you went with a larger sized card and all that silver and gold is stunning! Wow, wow, wow! Oh how I love this card, Sheila! Wishing I had an Archiver's! stunning Sheila. This is just wonderful. Love the gold and silver together. Wonderful glimmery, shimmery layers for the Christmas tree! I really love this tree image in silver and gold Sheila! A real work of art! Oh, my! This is so stunning - love the silver and gold (but don't know the song.....it is Burl Ives? Didn't he sing in that movie?). Spectacular and just one more great thing that came from your trip to Scrapfest. LOVE!